The complete set of Preen by Thornton-Bregazzi stamps are presented on a elegant envelope. 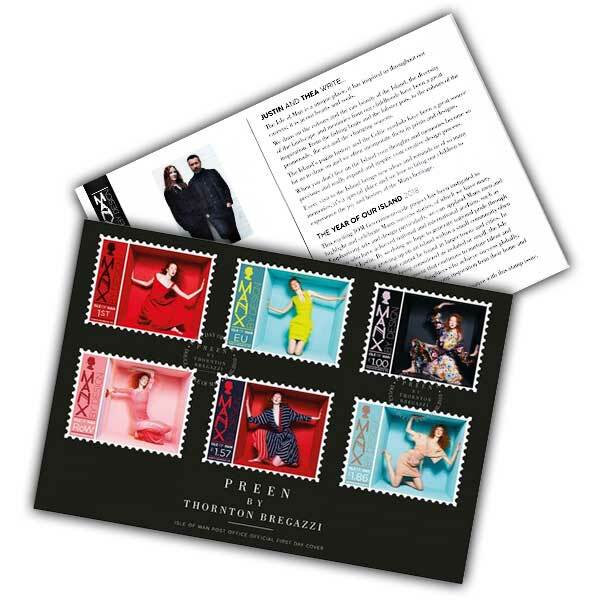 Each of the stamps is dedicated to among their most iconic pieces consisting of the Red Finella Dress as used by the Duchess of Cambridge during the 2016 Royal Tour of Canada, their Stripe Flintoff Dress which graced the cover of Vogue and their most popular dress, the Citrus Power Dress as used by Amy Winehouse and Gwyneth Paltrow. The Quilted Florals Dress from Preen's Autumn-Winter 2017 collection is featured, in addition to their Pink Velvet Hitch Dress from their Autumn-Winter 2016 collection which personified the season. The stamps are cancelled with a special postmark dated for the first day of issue and this sophisticated collectable is completed with a filler card with illuminating text from the designers, Justin Thornton and Thea Bregazzi, telling the story of their renowned brand name. Whether a dedicated follower of fashion or a lover of all things philatelic this would make a wonderful collectable or gift.